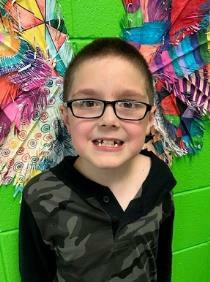 Aiden Thomason, a second-grader at Nolan Elementary, was the winner of the Superintendent's Scholastic Summer Reading Challenge for 2018. Nolan Elementary had more students to read over 1,000 minutes in the Summer Reading Challenge than any other Hamilton County School, officials said. The summer reading challenge works to motivate students to read all summer through weekly challenges, goals for schools and activities and resources for parents. Not only did he read every day during the summer, but Mr. Thomason said that he had continued the same reading schedule after school started. The Reading Challenge is designed to help students turn the “summer slide”- the reading loss which can occur over the summer months – into a “summer leap” by discovering the joy and magic of reading, officials said. Mr. Thomason loves the Who Was series of books and the Magic Tree House series. He said he would like to meet Mary Pope Osborne, the author of the Magic Tree House books.